May will be here before you know it. Mother’s Day, graduations, and Memorial Day. We are on the slippery slide that takes us into Summer! A lot of your display area will be featuring astronauts and outer space, but here are ten more ideas for programming and displays. Bring a small bike into the library and place it on a table. Gather books about bikes, fiction and nonfiction and display them on the table around the bike. Use this guide to hold a bike rodeo where the children of your community can practice and develop skills that will help them to become better bicyclists and avoid typical crashes. May the Fourth Be With You! And beware tomorrow – Revenge of the 5th! Prepare a display of all your Star Wars books and DVDs. Make origami Star Wars characters using the help of Tom Angleberger’s popular Origami Yoda series. Teacher Appreciation Week is a week-long celebration in recognition of teachers and the contributions they make to education and society. It is held in the first full week of May of every year and provides an opportunity for students, their parents, and school principals to show their appreciation for the hard work teachers do and the long hours many of them put in. Prepare a display of books that feature school and teachers. Remind you patrons to show their appreciation for the teachers in your community. The first ever Westminster Kennel Club Dog Show was held 142 years ago. Prepare a display of your nonfiction dog books—children’s or adult’s. Invite a local breeder to give a presentation on show dogs and their characteristics. Curtis was born in Flint, Michigan. He is an American writer of children’s books. He is known for the Newbery Medal-winning Bud, Not Buddy and The Watsons Go to Birmingham – 1963. The latter was adapted for a TV movie of the same name, which aired on the Hallmark Channel in 2013. Place a small poster acknowledging his birthday on the shelves near his books. Fill a mason jar with different kinds of chocolate chips and place it on the circulation desk near the checkout station. Challenge all who borrow material today to estimate how many are inside. Offer a package of chocolate chip cookies for the closest guess. Visit a local strawberry patch or pick up a pint of fresh strawberries. Encourage patrons to try out a new recipe to celebrate the beginning of strawberry season. Find books in your collection that have the word “strawberry” in the title and display them on a red tablecloth with printouts of the recipes for patrons to take home. What child hasn’t been lulled to sleep by the gentle rhymes of Margaret Wise Brown’s classic Goodnight Moon? Brown, a former teacher, believed that very young children could be fascinated in the simple pleasures of the world around them, and created some of the most enduring and beloved children s books of all time. Develop a display in the children’s room with the book and items from the Goodnight Moon story. Honor those who died in the service of our nation. Display books about the monuments erected to commemorate those in the armed forces lost in combat. Give your patrons small flags to decorate their yards. Pull together a list of tobacco cessation resources to hand out or feature on your social media. BONUS Library Trivia – The New York Public Library was dedicated on May 23, 1911. 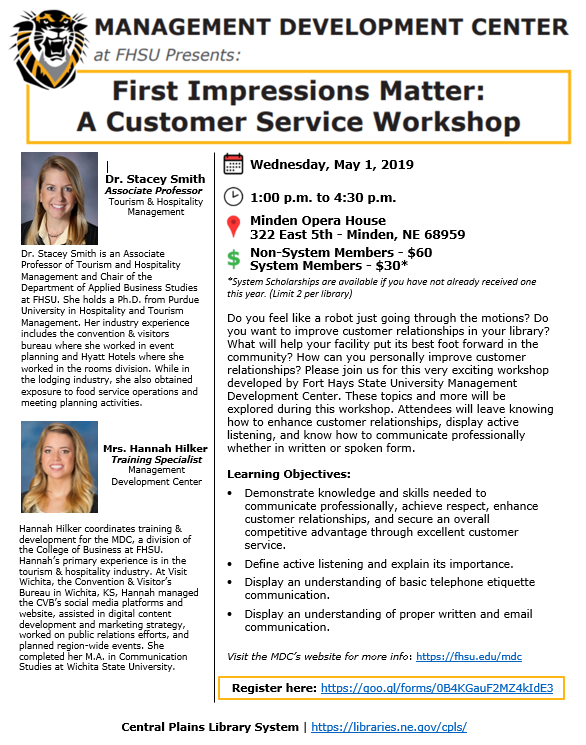 Please join us for this very exciting workshop developed by Fort Hays State University Management Development Center. These topics and more will be explored during the workshop. 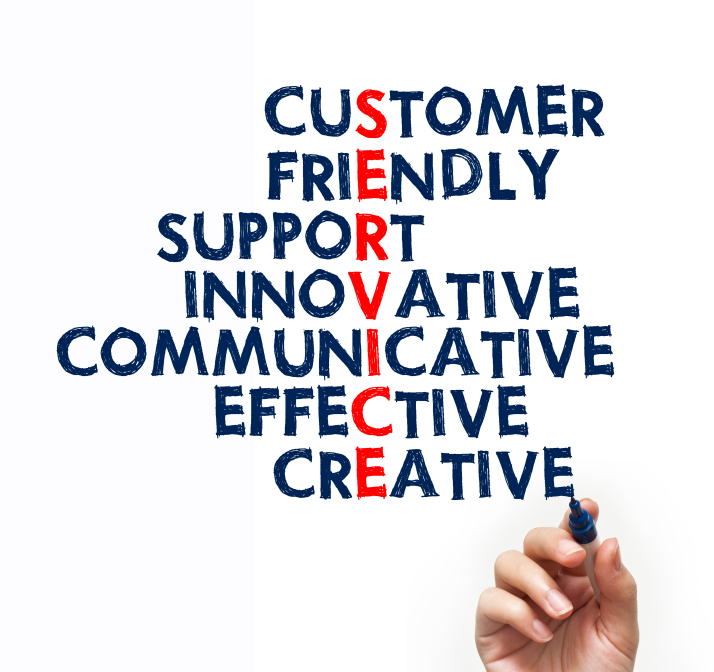 Attendees will leave knowing how to enhance customer relationships, display active listening, and know how to communicate professionally whether in written or spoken form. For more information and details regarding this event, please see this flyer. To get registered for this exciting workshop, please click here. Finally, we are having some days with sunshine! Maybe spring has not abandoned us. I didn’t know if I was going to make it through this spell of crazy weather, but the sunshine is making me hopeful. Find a number of books with covers that are a sunny yellow. 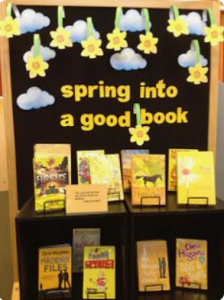 Get some artificial daffodils (try the Dollar Tree), pin them to the board, and prepare a display with the words “Spring Into a Good Book.” You will smile every time someone checks out a yellow book. Here are ten more display and program ideas for April. National Humor Month was conceived as a means to heighten public awareness of the therapeutic value of humor. Laughter and joy – the benchmarks of humor – lead to improved well-being, boosted morale, increased communication skills, and an enriched quality of life. It’s no coincidence that the month begins with April Fool’s Day, a day which has sanctioned frivolity and amusement for hundreds of years. Display your joke and riddle books and the funny picture books on this list. This website is loaded with resources and projects related to humor. Laugh it up! National Poetry Month was inaugurated by the Academy of American Poets in 1996. Over the years, it has become the largest literary celebration in the world with schools, publishers, libraries, booksellers, and poets celebrating poetry’s vital place in our culture. Display poetry books from all areas of your collection along with your free National Poetry Month poster. Click here for 30 ways to celebrate. School Library Month is the American Association of School Librarians’ celebration of school librarians and their programs. Every April school librarians are encouraged to host activities to help their school and local community celebrate the essential role that strong school library programs play in transforming learning. The 2019 theme is Everyone Belongs @ Your School Library and the 2019 spokesperson is Dav Pilkey. Click on this link http://www.ala.org/aasl/advocacy/slm for free web graphics and printable posters for your display. Maya Angelou was an American poet, singer, memoirist, and civil rights activist. She published seven autobiographies, three books of essays, several books of poetry, and is credited with a list of plays, movies, and television shows spanning over 50 years. She received dozens of awards and more than 50 honorary degrees. Create a display of her work and those inspired by her. The theme for this year is Libraries = Strong Communities. Melinda Gates is the 2019 National Library Week Honorary Chair. Go to this website for social media graphics for your Facebook or Twitter account. National Unicorn Day is observed annually on April 9. Unicorns have been a popular mythical creature since the Ancient Greek times, when people believed they lived in exotic India. While they were originally considered to be fierce, powerful animals, they are now often seen as a symbol of love, purity, enchantment and magic. Unicorns appear in many movies and cartoons as magical creatures. They are depicted as a horse-like creature with a single pointed horn in the middle of their foreheads. Unicorns are loved by both children and adults. Coordinate an all-unicorn program of crafts and fun. The Titanic sank on this day in 1912 in the icy Atlantic. Display your books and watch the movie…again. Celebrate baseball with a special display today. Gather your books—fiction and nonfiction—and add some gloves, bats, and balls to attract attention. Prepare a bookmark with a list of baseball books using this website for the final touch. On this day in 2008, Danica Patrick became the first female IndyCar winner when she won the Indy Japan 300 in Montegi, Japan. Feature books on race car driving today. April 26th is designated as National Audubon Day. This day is set aside to honor the birth of John James Audubon (April 26, 1785 – January 27, 1851). Audubon was a French-American ornithologist, naturalist, and painter noted for his extensive studies of American birds and his detailed illustrations of the birds in their natural habitats. Display your books about birds with some decorative bird houses. March is only one week away! What happened to February? Here at the CPLS Office, we have been wrapped up in “Full S.T.E.A.M. Ahead” February. We have enjoyed a month-long learning adventure. When I think about March, leprechauns in green hats holding clovers come to mind. If you want to construct a leprechaun trap, follow this link for 85+ Ideas for St. Patrick’s Day Mischief and Fun. 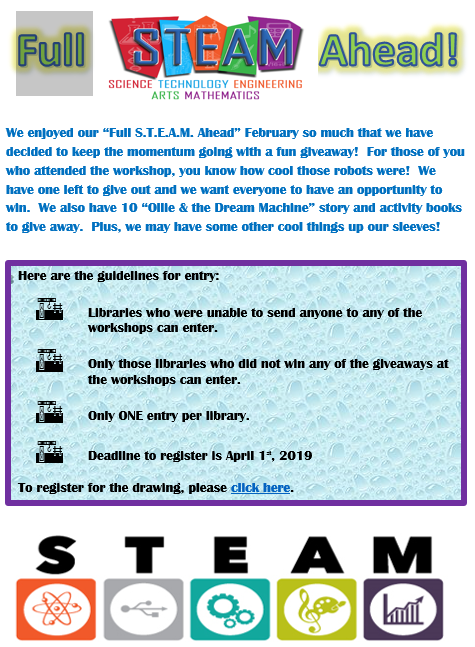 Here are ten more display and program ideas for March. Reading aloud is the “single most important activity” parents can do to prepare their child for reading and learning. This website includes information about the 21-Day Challenge going on in March 2019. Download posters, infographics, certificates of participation and more! The theme for 2019 is “Visionary Women: Champions of Peace & Nonviolence.” This year we honor women who have led efforts to end war, violence, and injustice and pioneered the use of nonviolence to change society. Display books about women’s history including biographies. For more information or to order posters, follow this link. Since March 2nd is a Saturday this year, the National Education Association’s Read Across America Day is celebrated on Friday, March 1. 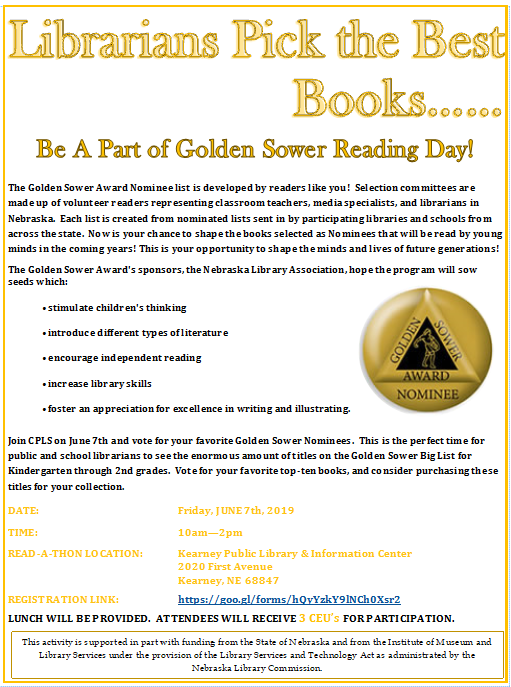 Click on this link for activities that are perfect for celebrating readers all year long. Display your Dr. Seuss books and dvds. These items get checked out anyway, but once they are displayed, they will circulate by the bag-full. Teen Tech Week is a national initiative sponsored by YALSA and is aimed at teens, their parents, educators and other concerned adults. The purpose of Teen Tech Week is to ensure that teens are competent and ethical users of digital media. Teen Tech Week encourages teens to use libraries’ nonprint resources for education and recreation, and to recognize that librarians are qualified, trusted professionals in the field of information technology. 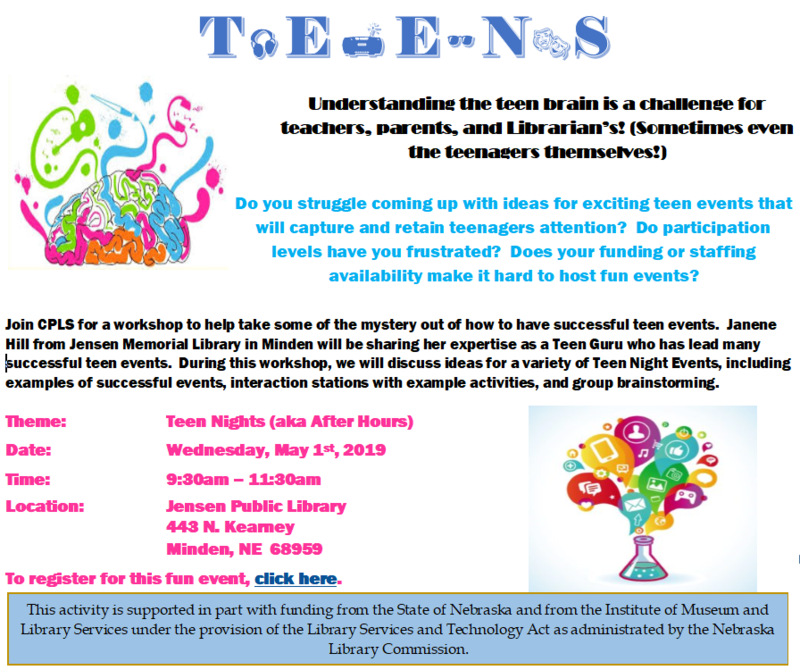 Teen Tech Week has a general theme of Get Connected @ your library. Millions of teens do not have access to a home computer and, were it not for libraries, would miss opportunities to gain important digital literacy skills. Libraries offer a bridge across the digital divide. Libraries also recognize that digital media plays an important part in a teens’ life. That is why more libraries than ever are helping teens build critical digital literacy skills, which they will use to obtain scholarships, secure jobs, effectively manage their online identity and more. Click on this link for a variety of resources in addition to 50 Ideas for Celebrating TTW. Share some amazing book trailers for Pilkey’s popular series with your readers of all ages, including the book trailer for Dog Man 6: Brawl of the Wild. Display Pilkey’s books on a table in your children’s area with bookmarks listing his book series. Encourage patrons bake pies and bring them to the library for a pie eating competition. “Pizza” and “Pineapple. These are just examples of food starting with “Pi”. Share this food with patrons during Pi day. Put that fork down and pick up that pen. Conduct a contest on how many words starting with “Pi” can a patron write. The winner will get (of course) an appetizing pie. Freedom of Information Day is an annual event on March 16, the birthday of James Madison, who is widely regarded as the Father of the Constitution and the foremost advocate for openness in government. Each year, the James Madison Award and the Eileen Cooke State & Local Madison Award are presented by ALA on Freedom of Information Day to recognize those individuals or groups that have championed, protected, and promoted public access to government information and the public’s right to know. Go to this link for more information. World Poetry Day is celebrated on March 21, and was declared by UNESCO in 1999. Its purpose is to promote the reading, writing, publishing and teaching of poetry throughout the world and, as the original UNESCO declaration says, to “give fresh recognition and impetus to national, regional and international poetry movements”. Celebrated around the world on March 25, Tolkien Reading Day is a favorite among fans of the renowned author. Display books, audiobooks, and DVDs of Tolkien’s works. Get out crayons, paper, and coloring books (including adult coloring pages), and encourage your patrons to get creative with coloring! For even more Display Ideas, follow me on Pinterest. 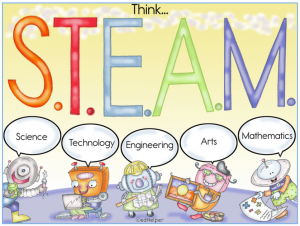 Due to the snow today, our last Full S.T.E.A.M. Ahead Workshop had to be cancelled. However, that opens up the opportunity to everyone who thought about coming but maybe the dates didn’t work with your schedule! Here is your chance to participate in a great workshop. 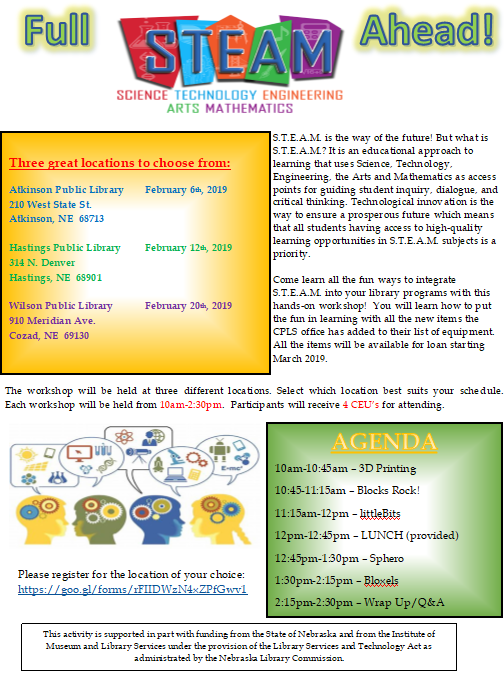 Come learn all the fun ways to integrate S.T.E.A.M. 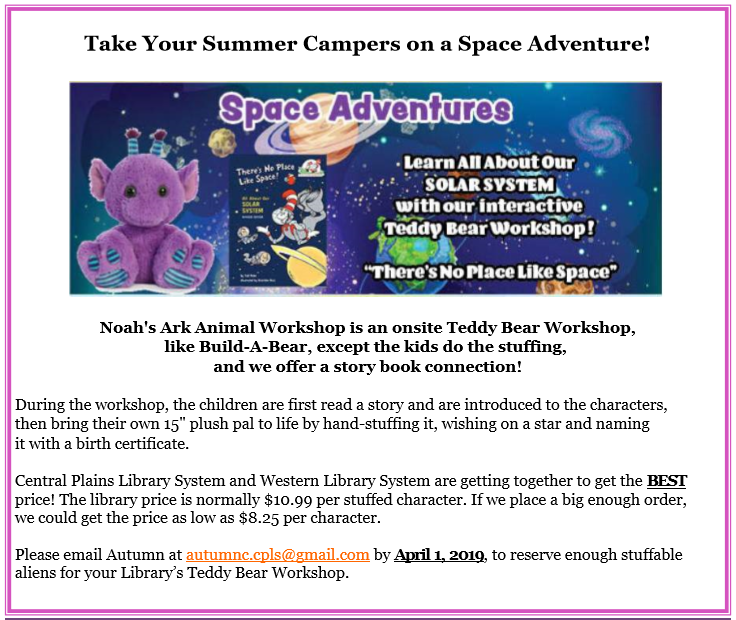 into your library programs with this hands-on workshop! You will learn how to put the fun in learning with all the new items the CPLS office has added to their list of equipment. All the items will be available for loan starting March 2019.